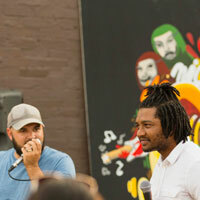 Lit-Hop is Jeremy Bryan (left), a Parent's Choice Gold Award winning musician and author; Luis Rivera (not pictured), an experienced and travelled choreographer, performer, and educator; and Samuel Smith (right), a KC-native and youth mentor from the city's East Side. Lit-Hop is also an experience: a 50 minute all-school assembly--with lots of interaction and movement--that casts an inspirational vision for a lifelong learning journey of good relationships, unity in diversity, increased literacy, spiritual and bodily health, while addressing bullying, addiction, heartbreak, and triumph over adversity. In addition to high-quality concert assemblies, we offer "Writes of Passage" workshops and residencies, during which a class-sized group of youth compose, choreograph, record, and then perform their own song during an assembly. Lit-Hop performs music from a selection of over 50 songs by The Figureheads, of which Jeremy Bryan is a founding member. Each performance and workshop is tailored to an age group (elementary, middle, or high school).